It's Tuesday and that means another AiFactory challenge on the challenge blog! This week's challenge is a super fun one! We are supposed to make a Halloween item using Softpencil's adorable Little Witch. 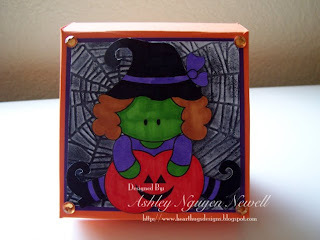 How cute is this little stamp for Halloween? I love her! This week, I made a little pizza box from the tutorial by Jen Del Muro. You can find it on SCS HERE. It's perfect for tucking away a few little candies for your kids or any special someone. The background here is a spider web embossing folder. It was a WishRAK item done on white paper. I sponged it with black Memento ink ad then covered it with Black Diamond Stickles for some sparkle. The little witch is colored with markers, cut out and put on with pop dots. And then I finished with some bling. Hop on over to the AiFactory Challenge blog to read all the details. Play along and you could win a prize! Check out the DT for some more awesome inspiration! I love this Ashley! So cute! This is just to cute and love the colors. Cute, cute, cute!!! I love the pizza box! I love the colors too! Aw!!! How cute!! Mine is wearing purple, too. I *almost* did a pizza box - were you channeling me? So cute!! I love that she looks like the Wicked Witch, cute style!